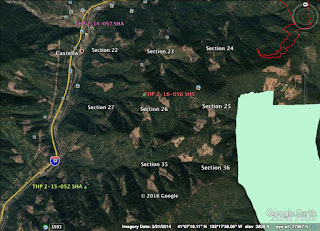 THPBlog: Sierra Pacific Industries to clearcut log near the Pacific Crest Trail and West Girard Roadless Area. Sierra Pacific Industries to clearcut log near the Pacific Crest Trail and West Girard Roadless Area. This THP is about 12 miles south of Mt Shasta, CA and about 1 mi east of Castella, CA and Highway 5 at an elevation of 2,200 to 5,000 feet. Sierra Pacific Industries is planning a clearcut tractor and cable logging operation on steep and unstable slopes in ponderosa pine, Douglas fir, incense cedar and sugar pine forests. There are 3 unstable areas related to roads including an unstable area above unit 26A (cut bank instability) in section 26 and 2 unstable areas in section 23. Section 24 is within .5 miles of the Pacific Crest Trail, and sections 25 and 36 are adjacent to the West Girard Roadless Area. SPI wants to use ground based equipment on steep slopes over 65% grade within unit 24B, and construct 600 feet of new road with an 18% grade on steep slopes exceeding 65% grade adjacent to unit 23B. Osprey were reported 1,200 feet west of unit 27B and 1,600 feet NW of unit 27A, and western pond turtles were reported at North Salt Creek which is 2 miles downstream from the THP area, and at Boulder Creek. There are 2 spotted owl nesting territories within 1.3 miles of the THP area.